Create a dreamy atmosphere for your fish! 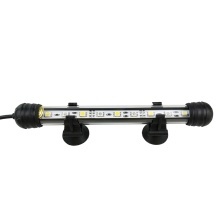 Equipped with energy-saving LEDs, this kind of portable, flexible light weight aquarium light is easy to install and carry. The diameter is only 0.7in, free up for more viewing space, mini in size and light in weight, easy to carry. Strong suction helps to fix firmly in aquarium, easy to mount and fix. IP68 waterproof design, can be fully submerged into water. Be excellent for aquarium, pool and other similar occasions.